Dogecoin is set up for rewarding the content creators on online platforms like Twitter and Reddit. It was established in 2013 after being taken out of Litecoin. The founders if this crypto, Billy Markus from Portland, Oregon and Jackson Palmer from Sydney, Australia, had made the whole platform based on the logo of a popular “Doge” Internet meme. The internet meme featured a Shiba Inu on its logo. It facilitates anonymous sharing platform through which the payments can be made securely without any centralized route. Though this coin is majorly used for social media content sharing, it has also been used for other kinds of value transfers as well. Dogecoin (DOGE) is ranked 26th in the crypto market. With a whopping return on investment (ROI) of 336.80%, the coin has its circulation at par with the limit at 118,905,335,174 DOGE. The current market cap of Dogecoin (DOGE) rests at 291,231,728 USD on 02nd April at 01:24 UTC. The price of each coin in terms of USD is at 0.002449 USD at the same UTC and price in terms of BTC stands at 0.00000059 BTC. The 24 h volume is 49,605,121 USD. 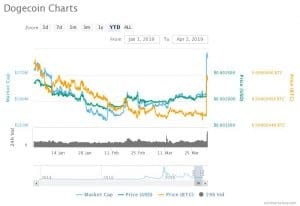 The year 2019 has been an inconsistent year for Dogecoin (DOGE). The year started as high as 0.002346 USD. But, soon it started to fall. The lowest point was reached just a month after the year started. But, the trend of past one month is to be seen with much care. With some downward movements, the line is finally picking up. 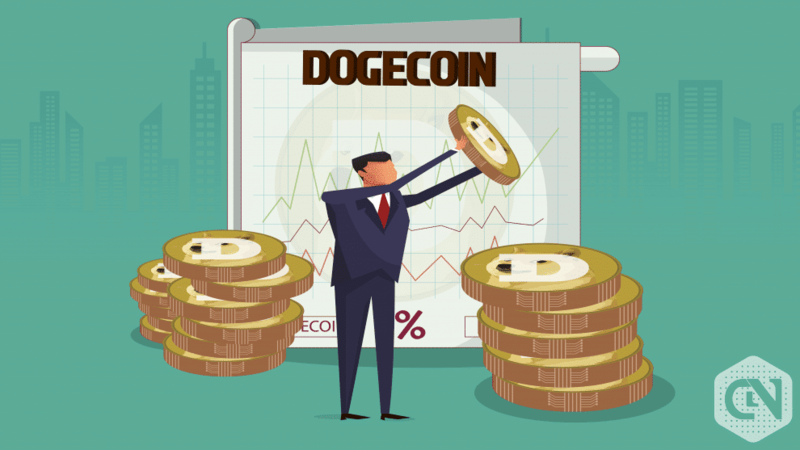 The market cap of Dogecoin (DOGE) on February 25 was 231,036,448 USD. And on the same day price of each coin with respect to USD and BTC stood at 0.001951 and 0.00000051 respectively. The current market cap is almost 26 % more than the value of February 25. And the current price of each coin in USD is 25.52 % more than the value in terms of USD on February 25. The coin has been growing at a stable pace since 13th March, and it has yielded a paradigm shift towards upper level on 1st April itself. After weeks of stable growth, a steep rise was never expected. But, Dogecoin (DOGE) gave a surprise with the starting of this month as well as the new quarter. Experts have believed that the slower trend was expected to continue, but the recent rise in the price with respect to USD as well as the market cap has shown the confidence of the market on this crypto. The rise should continue for some more days before going to a triangle. And we believe once it is trapped into the triangle, it would be tough as well as time taking to recover. The best we should target as of now should stand at 0.003 USD, and it may also reach 0.004 USD before failing to a lower trend. So, investors are advised to trade keeping this in mind and secure their positions accordingly.